Most people get tattoos because they want others to see them. Your body is the canvas that displays these beautiful works of art. Tattoos are basically outward manifestations of our inner interests and selves. In addition, they look really cool. A tattoo is one way to let the world know that you have no regerts……er, regrets. OK, so maybe there are people who have tattoos that they wish would disappear. That mohawked skull inked on your lower arm looked cool when you got it done back in 1995, when your life consisted of flipping burgers at Red Robin and listening to Green Day and The Offspring. Even your girlfriend at the time really dug your ink. Now, you head up projects for a Fortune 500 company are happily married and have two fairly well-behaved kids. Oh, and a really bad tattoo. While your wife hates your tattoo, she vowed to stick with you through the good, the bad and the ugly and has learned to live with it. Your boss, on the other hand, would probably flip and fire you on the spot if you came to work exposing the thing. This is the reason why you wear long sleeves to the office every single day, even when the temperature in the summer hit triple digits at times. 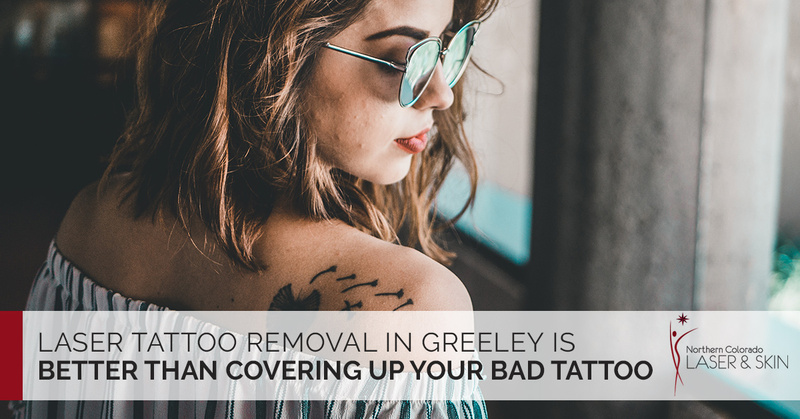 You could, of course, just pay a visit to Northern Colorado Laser and Skin in Greeley and utilize their tattoo removal services. Or you could find clever ways to hide the bad tattoos on your body. A tattoo on the back of your neck was all the rage a few years ago. But if you are going to meet your boyfriend’s very conservative parents for the very first time, you might want to cover it up. You can wear your hair in a loose ponytail and conceal the back of your neck or rock the messy bedhead look and hide that ink. His parents will never know what lurks under your hair. Tattoos on the ankle or wrist can be easily covered with an Ace bandage. It is a bit of a risk to fake an injury, but desperate people will do anything to hide a bad tattoo. A pair of Converse All Star high-tops will not only give you a classic look, but they will also hide that hideous tattoo on your ankle. You could also just wear socks. If you have a tattoo on your wrist and need to hide it, you are in luck because this is one of the easiest places to hide. You can hide your tattoo by wearing a really thick bangle or by stacking several skinny bangles. You guys can find a watch with a really thick band and that should be enough to cover your wrist tattoo, Just one question: Why do you have a wrist tattoo anyway? Instead of desperately trying to hide your tattoo, you should come by Northern Colorado Laser and Skin for laser tattoo removal.